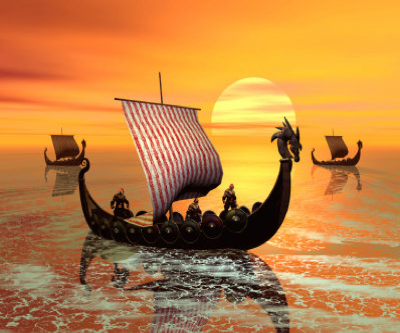 Researchers from the University of Rennes in France say a calcite crystal that was discovered in the wreckage of a 421-year-old ship could be a sunstone, the legendary crystal believed to have helped Vikings navigate the oceans. In a paper published Wednesday, the experts claim the whitish chunk of Icelandic calcite found at the bottom of the English Channel, resembles very closely the crystal sailors used as a kind of solar compass, to determine the position of the sun even at night or during overcast days. "We demonstrate that Alderney-like crystals could really have been used as an accurate optical sun compass as an aid to ancient navigation, when the Sun was hidden by clouds or below the horizon," the study said. The authors said their findings might help identify other crystals used by the Vikings. "The evolution of the Alderney crystal lends hope for identifying other calcite crystals in Viking shipwrecks, burials or settlements." The paper — written with Guy Ropars, Jacques Lucas, and a group of Britons from the Alderney Maritime Trust — was published Wednesday in the Proceedings of the Royal Society A.